What should I do about my Ash tree?? Native ash trees (whether white, green or black) make up a large portion of the urban forest across eastern North America. In Prince Edward County, Quinte West and Belleville area it is hard to go too far without seeing one. They are a species that grows relatively quickly, is very hardy and has a beautiful full canopy in the summer making it a popular shade and landscape species. 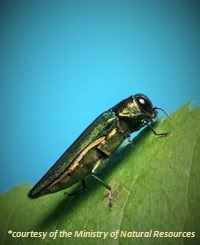 However that all changed in 2002 when Emerald Ash Borer was discovered in both Ontario and Michigan. Since then this insect has decimated ash populations killing off hundreds of millions of trees, and it isn’t slowing down. The adult beetle does very little damage to the host tree, feeding on leaves through the summer. It is the larvae, or immature beetles living just under the bark that actually kill the trees. These little grubs eat away the water and nutrient conducting tissues beneath the bark effectively starving the host tree. Infested trees typically die within 1-3 years. As a property owner this is concerning. Trees that have been a part of the landscape for years are now directly threatened. Although not rampant in the area yet, the infestation of Emerald Ash Borer is inevitable and choices will need to be made. Thankfully there is treatment available to save some of the trees. Direct injections into the trunk controls the larvae for two years before it is needed to be applied again. While this is a very effective management tool, it is impractical for those with a large percentage of ash or with a limited budget. Care should be taken in deciding which trees to save. Trees that are irreplaceable, heritage specimens or that have sentimental value are excellent candidates. If you are considering to treat an ash on your property do not wait for the insect to reach it. Preventative treatment is the most effective and your tree will have the best chance of survival. Once the canopy reaches a 30% thinning and/or die back the treatment may not be as effective. If you decide not to inoculate your ash tree the next step is to know when to have i t professionally removed. Put simply, your tree generally has its most strength when the canopy is fully green. A completely dead tree can be very unpredictable and dangerous. Especially in restricted areas where an aerial device (bucket truck or crane) cannot reach, it is important to have the tree removed when it is still safe to work on. This will keep the cost of removal lower for you, as well as make the removal process safer and more enjoyable to those completing it. As we go through the next growing season keep an eye on your trees. When infested by EAB the canopy will dieback and/or thin out from the top down. Also new sprouts on the lower trunk of the tree can indicate the insects’ presence. Once the top 1/3 of the canopy is leafless, you should consult with a Certified Arborist to get a quote for removal. Opting to replace trees now is also a great idea. Planting new trees while your ash are still alive and well will give the replacement species a chance to get established. This way there will be a transition from one species to another without leaving your property bare. Some excellent replacement species are Sugar Maple, Red Oak, Honey Locust, American Sycamore and Hackberry. Consulting with a professional before planting will ensure that a species is chosen that fits your needs and will thrive in your specific area. County Arborists is proud to announce that we will be offering Emerald Ash Borer Control this season. If you have any questions regarding your tree, or if you would like a quote please fill out a “Contact Us” form or give us a call at 613-969-6788. For more information about Emerald Ash Borer in our area check out the links below.